Digital signage refers to the use of digital displays in order to exhibit digital images, video, and other media. The digital signage market has witnessed various technological advancements and registered remarkably consistent growth and exponential increase in demand in the last decade. The digital signage software market was valued at USD 4.48 billion in 2016 and is expected to reach USD 9.24 billion by 2023, at a CAGR of 10.2% during the forecast period. The base year considered for the study is 2016, and the forecast period is between 2017 and 2023. Return on investment (ROI) is calculated by considering factors such as venue audience and customer satisfaction. The venue audience helps measure the direct revenue, whereas customer satisfaction helps measure the indirect revenue. Digital signage is gaining ground in various applications because of its benefits and leading to the increasing ROI. It increases the efficiency by limiting the time and cost associated with maintaining letter boards or printing and distributing posters. It can be used to display emergency messages, directional assistance, schedules, and agendas. It also helps drive sales, improve customer experience, and provide a competitive advantage, leading to an increase in the ROI. The returns on investment for various players in the digital signage market are increasing through direct and indirect revenues. Direct revenue consists of high sales volume for products that are directly promoted via in-store marketing solutions and the revenue generated through the sponsorship of the content of a brand or a company. Indirect revenue includes a measurable increase in brand recognition and awareness of products or services presented on in-store screens. The digital signage software market is dominated by Signagelive (UK), Scala Inc. (US), Broadsign International LLC (Canada), Omnivex Corporation (Canada), and Navori (Switzerland). The other players in this market, include IntuiLab SA (France), Mvix, Inc.(US), NoviSign Digital Signage Inc.(Israel), Four Winds Interactive (US), Rise Vision (Canada), Planar Systems Inc.(US), NEC Display Solutions Ltd (Japan), Panasonic Corporation (Japan), Sharp Corporation (Japan), and Samsung Electronics Co. Ltd. (South Korea). Signagelive collaborated with Brightsign, LLC (US) to design support solution for their digital signage media player. Signagelive has developed a HTML5-based solution with web trigger support for this media player. Signagelive entered into a partnership with Phillips Professional Display Solutions (Netherlands) to offer solutions for Android-based system on SoC Philips displays. Scala was selected by Formula Kino (Russia), one of the leading cinema chains, to install digital signage solution in the existing 460 screens. Scala solutions enable users to automate functions. Scala partnered British Telecommunications Plc (BT) (UK) to provide digital solutions globally. The partnership is likely to offer customized solutions for various industry sectors. Laysa Digital LLC (Russia) selected BroadSign to provide automated DOOH software for its transit network in Russia. BroadSign received a contract from Mediaperformances SA (France) to provide DOOH advertising solutions to retail networks. The San Francisco International Airport (SFO), one of the largest in the US, chose Omnivex Moxie to create an interactive wayfinding tool. 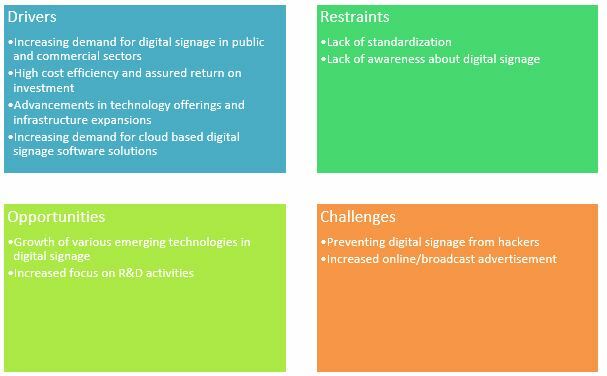 Which are the top use cases/applications/verticals of digital signage software market to invest in and what are the untapped opportunities? Who are the major current and potential competitors in the market and what are their top priorities, strategies, and developments? In today’s world, digital signage plays a crucial role in the in the field of information and advertising network. The digital signage software market was valued at USD 4.48 billion in 2016 and is expected to reach USD 9.24 billion by 2023, at a CAGR of 10.2% during the forecast period. The growth of the market is propelled by the increasing demand for digital signage in public and commercial sectors, along with its high cost efficiency and assured return on investment. The market is further driven by factors such as increasing focus on energy consumption, the rising demand of OLED-based displays, and improvements in technology offerings & infrastructure expansions. However, the lack of standardization and the lack of awareness about digital signage are inhibiting the growth of the digital signage market globally. Moreover, the protection of digital signage from power issues and the development of equipment suitable for all weather conditions are the key challenges for the players in this industry. 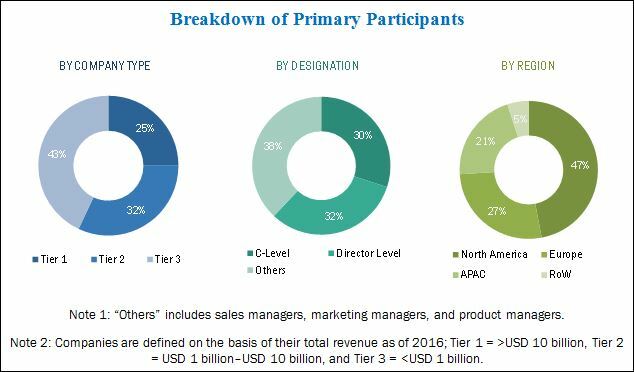 Technological innovations such as touch screen technology, near-field communication technologies, and so on have created opportunities for this market. Digital signage systems such as displays, media players, and others are supported by software for the ease of accessibility. The sales of these digital signage devices are highly dependent on the user interfaces provided by the software for easy accessibility. The different software considered in the report includes edge server software, content management system, and other software solutions including analytics-related software. The commercial application held the largest share of the digital signage software market in 2016 and is expected to register the highest CAGR during the forecast period. This is mainly due to increasing demand for digital signage in commercial applications along with improvements in technology offerings & infrastructure expansions. In indoor advertising, especially in the commercial application (retail, healthcare, and hospitality sectors), content needs to be managed and changed periodically because of the high customer interaction in these sectors. As the usage of products such as displays, media players, and projectors in retail and hospitality increases, the content management services in the digital signage market would also experience growth. North America held the largest share of the digital signage market in 2016, followed by Europe. The digital signage software market is expected to have a high growth rate in APAC, mainly owing to the industrialization in this region. APAC is witnessing the transformation in the digital signage industry, and a number of players are entering this market with new innovations. 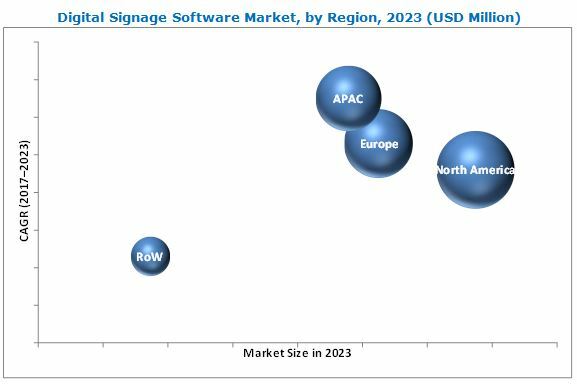 In 2016, the digital signage software market was dominated by Scala Inc. (US), Signagelive (UK), Broadsign International LLC (Canada), Omnivex Corporation (Canada), and Navori (Switzerland). This chapter profiles these major players along with other key players such as IntuiLab SA (France), Mvix, Inc. (US), NoviSign Digital Signage Inc. (Israel), Four Winds Interactive (US), Rise Vision (Canada), Planar Systems Inc. (US), NEC Display Solutions (Japan) ADFLOW Networks (Canada), Samsung Electronics Co. ltd (South Korea), and Panasonic Corporation (Japan). *Top 25 Companies Analyzed for This Study are - Scala Inc. (US), Signagelive (UK), NEC Display Solutions Ltd. (Japan), Broadsign International LLC (Canada), Omnivex Corporation (Canada), Panasonic Corporation (Japan), Planar Systems Inc. (US), Mvix, Inc. (US), Navori (Switzerland), Cisco Systems, Inc. (US), Sharp Corporation (Japan), Samsung Electronics Co. Ltd. (South Korea), Novisign Digital Signage Inc. (Israel), Four Winds Interactive (US), Adflow Networks (Canada), Intuilab Sa (France), Rise Vision (Canada), Acquire Digital (US), Visix, Inc. (US), Xtreme Media Pvt. Ltd. (India), Onelan Limited (UK), Dise International Ab (Sweden), Truknox Technologies Pvt. Ltd. (India), Ycd Multimedia (US), L Squared (Canada). 12.10 Novisign Digital Signage Inc.
12.14 NEC Display Solutions Ltd.
12.16 Samsung Electronics Co. Ltd.